Welcome to a tribute to one of the eternally durable and most frequently-covered rock songs of all time. It has the fast chugging riffage that made it perfect for any hard rock bands that were looking for a good blues song to cover back in the early days, which I guess is why it happened so often. What inspired this volume of TDATS is the frequency with which I have run into it, a large number of previous TDATS-appearing bands have recorded it. There's no wasting time with an intro in the Freddie King version of this song. It seems he set the president with that urgent, repetitive nature of the opening D chord, followed by the descending scale, getting down to business straight away and sounding mean as hell with it. It definitely has that essence of what is now called heavy metal, which is what I dig about it so much, and it's clear a lot of early heavy bands agreed! You can download track 15 on it's own here if you do not wish to download the whole thing again. [EDIT: An new track has been added to this comp today, 16th December 2014. This was found here, in a short piece from the youtube channel of record industry veteran Phillip Rauls. In it he presents another Don Nix-recorded version of the song, at the beginning of which, Don says he wrote it for Elvis Presley, who did not record it. Interestingly, even Don doesn't mention that Moloch were the first act to record it, and he himself says it was Freddie King. If you look in the comments of the youtube clip, you'll see Larry Changes (claiming to be a one-time Moloch member) asking why Phillip omitted to mention Moloch's version. Phillip says that the reaction to Moloch's version was so slight that it wasn't worth mentioning! The history of the song is entwined with producer/writer/musician Don Nix, the band Moloch, and the bluesman Freddie King. So entwined in fact, that it's been hard to get to the bottom of it. Most people familiar with the song will say that it's a Freddie King original, but it's not the case. Listen to the Tommy Bolin track in this comp, even he introduces it as a Freddie King song. The first time it appeared on record was the s/t album from Memphis's "Moloch" in 1969. At the time, Moloch guitarist Lee Baker was friends with Don Nix, who produced Moloch's sole album, and has writing credits on most of its tracks. 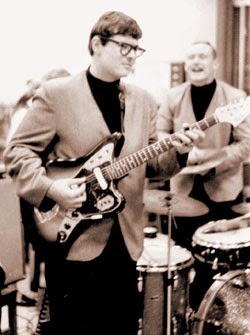 Don Nix has a connection to Freddie King also...having started out as saxophonist in Memphis R&B group The Mar-Keys, he became an important figure in "Memphis soul", producing for the associated Stax and Ardent labels. The Mar-Keys would evolve into R&B legends "Booker T. and the M.G. 's", which included such names as Steve Cropper. 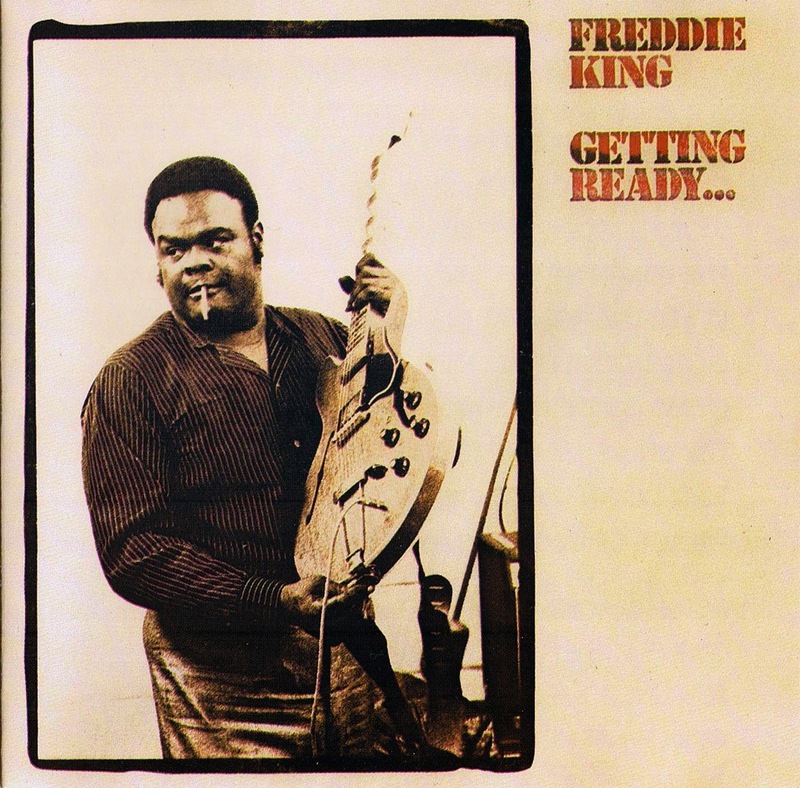 Freddie King's 1971 album 'Get Ready...' was produced by Don, with him writing two tracks (including Going Down) and co-writing two others. Regarding Moloch, I recently got in touch with the last-surviving member, bassist Steve Spear. He had this to tell me: "I remember being in the old Ardent studios on National with Moloch. I can’t remember what I played on (we are talking late 60’s). Lee Baker played bass on the tunes I didn't play on. I didn't play on the single [that came out in 1972 after the album]. 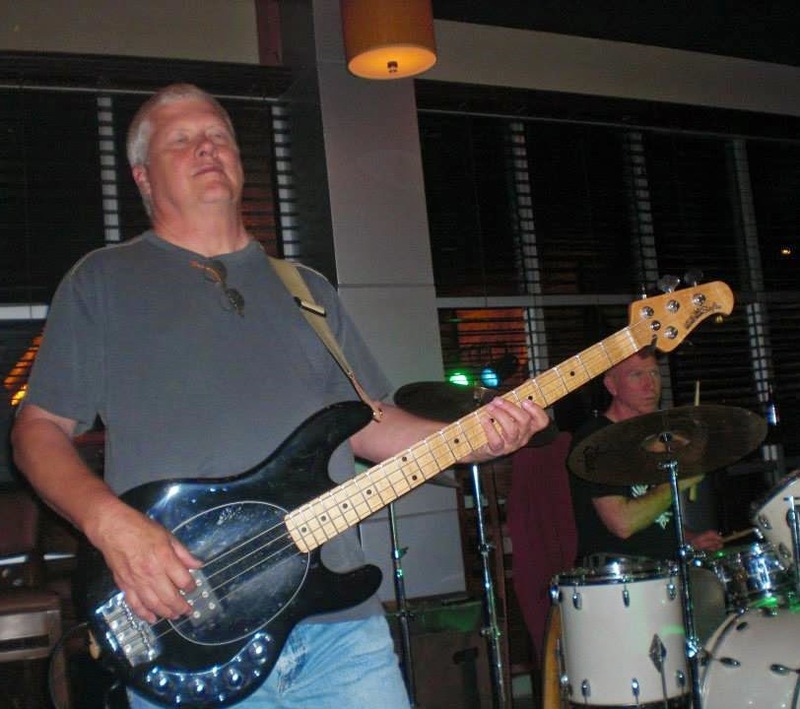 Don Nix actually recruited me for bass after the original bassist, Mike Reddock I think his name was, bowed out. As you know Don was in the Mar-Keys and Lee was in some of the early bands in Memphis. They both had an affinity for Furry Lewis. So I would assume that’s how they knew each other. I was the youngest in the band so I didn't know the earlier history of those guys. I’m involved in a project right now with Don. He is producing an album for Danny Green in Memphis. Drummer Joel Williams and I played on 4 tracks, 3 of which made it to the album. I think they are seeking a deal with Sony." Amongst other projects, Steve currently plays in "Down 2 Five". Following the tragic murder of Lee Baker in 1996, I have found some information regarding his later band Mud Boy and the Neutrons and Moloch, here, for those who are interested. Just to make things even clearer, in 1972 Don sang and released his own version of Going Down, as a single taken from the album "The Alabama State Troopers Road Show", a travelling revue designed to showcase the talents of various Southern musicians who had been signed to the Elektra imprint. Also included here are versions from some bands that will be well-known to TDATS readers; Walter Rossi (Vols 5 & 23), Chicken Shack (Vols 20 & 74), Freedom (Vols 79 & 100), Jukin' Bone (Vol 10) and Incredible Hog (Vols 4 & 63). The Incredible Hog version is taken from the Rise Above Relics reissue Vol 1 +4. The awesome pipes of Maggie Bell and Stone The Crows introduce the only female-vocalled version here; "Stone The Crows were formed after Maggie Bell was introduced to Les Harvey by his elder brother, Alex Harvey. After playing together in the Kinning Park Ramblers, they rejoined in a band named Power, later renamed Stone the Crows (after a British/Australian English exclamation of surprise or shock) by Led Zeppelin's manager, Peter Grant. The band was co-managed by Grant and Mark London. London was associated with Lulu as the co-writer of her signature song, "To Sir With Love" and was also married to Lulu's manager, Marion Massey. London had also managed the predecessor band Cartoone, which featured Les Harvey on guitar, and in which Peter Grant had a financial interest. Maggie Bell, vocals. Les Harvey, guitar. Colin Allen, drums; ex-Zoot Money's Big Roll Band and John Mayall's Bluesbreakers, later performed with Focus. James Dewar, bass; later performed and sang with Robin Trower's band. John McGinnis, keyboards. 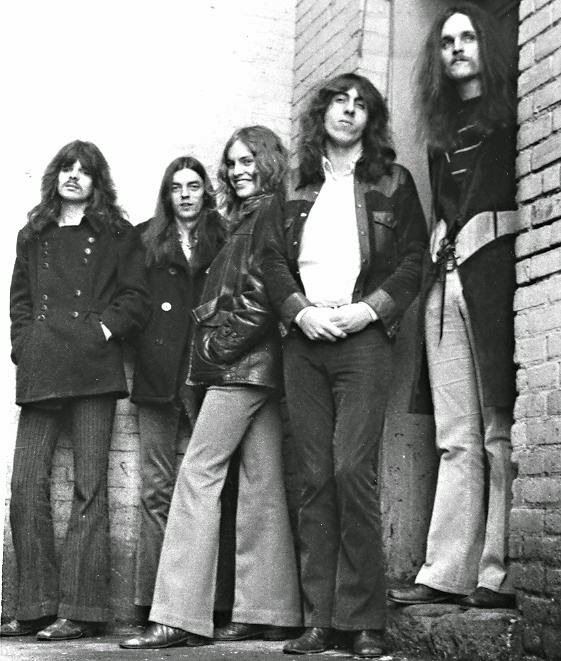 The band's first two albums were recorded by this line-up, with Bell's vocals "reminiscent of Janis Joplin". McGinnis and Dewar left in 1971, to be replaced by Ronnie Leahy and Steve Thompson. Jimmy McCulloch would subsequently replace Harvey as lead guitarist following Harvey's accidental on-stage death by electrocution at Swansea's Top Rank Suite in May 1972. As he was the band's primary songwriter as well as Maggie Bell's romantic partner, Harvey's death almost led to the Stone the Crows' breakup. Stone the Crows ultimately broke up in June 1973. Peter Grant would continue to manage Maggie Bell's career following the band's breakup, with Bell subsequently recording two solo albums under Grant's tutelage, Queen of the Night (1974) and Suicide Sal (1975), and a 1981 album with the Grant-managed band Midnight Flyer. Bell may be best known, however, for her session work on Rod Stewart's 1971 album Every Picture Tells a Story, in particular her co-lead vocal with Stewart on the album's title track (credited as "vocal abrasives"). Jimmy McCulloch joined Paul McCartney's group, Wings, in Nashville, Tennessee, in 1974." Dixie Peach (link) made one album in 1974. Their version of Goin' Down here is one of the most different sounding ones, having a long build-up and a slower vibe over-all. "Dixie Peach from Ohio, playing Southern blues-rock, has risen again. Formed in 1972 by slide guitarist extraordinaire, singer and songwriter Ira Stanley with Steve Williams (keyboards), Mike “Roscoe” Rousculp (bass), Tony Paulus (guitar, keyboards) and Jerry Barnhart (drums), they released one album (out of print) before breaking up in 1975. Reforming in 1998 and releasing Butta in 2002, they jam out better than ever, their spicy-as-barbecue sound featuring the original members save for drummer Steve Benson. 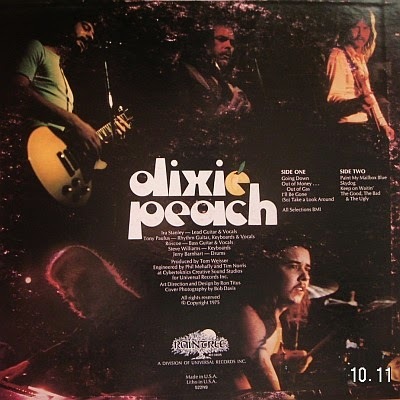 Beginning in 1973, Dixie Peach started touring full time and played gigs from Buffalo, New York to Tampa, Florida and released its first album in 1974. Dixie Peach has been an opening act for many national artists including Joe Walsh, Lee Roy Parnell, Johnny Winter, Cheap Trick, Tesla, Larry Carlton, Roy Buchanan, Spirit, New York Dolls, Billy Cobham, Blue Oyster Cult, and many others." Their album "Way Down East" followed (1973) along with two singles "Whiskey Woman" (1972) and "Cara Lynn' (1972). One very important fact of note, Jukin' Bone was one of the most electrifying live bands you will ever see. They went on tour, but never received enough promotion across the country, although they perhaps came very close to national stardom. Their November-December 1972 tour consisted of the following stops- Alabama (Montgomery & Huntsville), Arkansas (Ft Smith), Iowa (DesMoines), Kansas (Wichita), Louisiana (Monroe, Shreveport), Minnesota (Duluth, Minn,-St Paul), Missouri (Columbia), North Carolina (Ashville), North & South Dakota, Tennessee (Memphis), Texas (Austin, Dallas, Harlingen, Houston, Odessa, San Angelo, Waco) and Wisconsin (Madison, Sheboygan). July 14, 1973, drummer Danny Coward departed leaving Jukin Bone just a four man group (Mark Doyle, Joe Whiting, John DeMaso & Kevin Shwaryk). In the fall of 1973, Jukin Bone', one of Syracuse's greatest groups, disbanded. Mark Doyle went to play with DUV (Dave Hanlon, Rick Cua) and David Werner, Joe Whiting joined Bobby Comstock on tour and the rest went their separate ways." Berlin's Kathago, generally known for fusion/funk rather than hard rock or blues, played this cover live in 1976, available on their 'Live at the Roxy' LP. Allmusic :- "Just months after their formation in Berlin in 1970, Karthago began recording music for their first album. 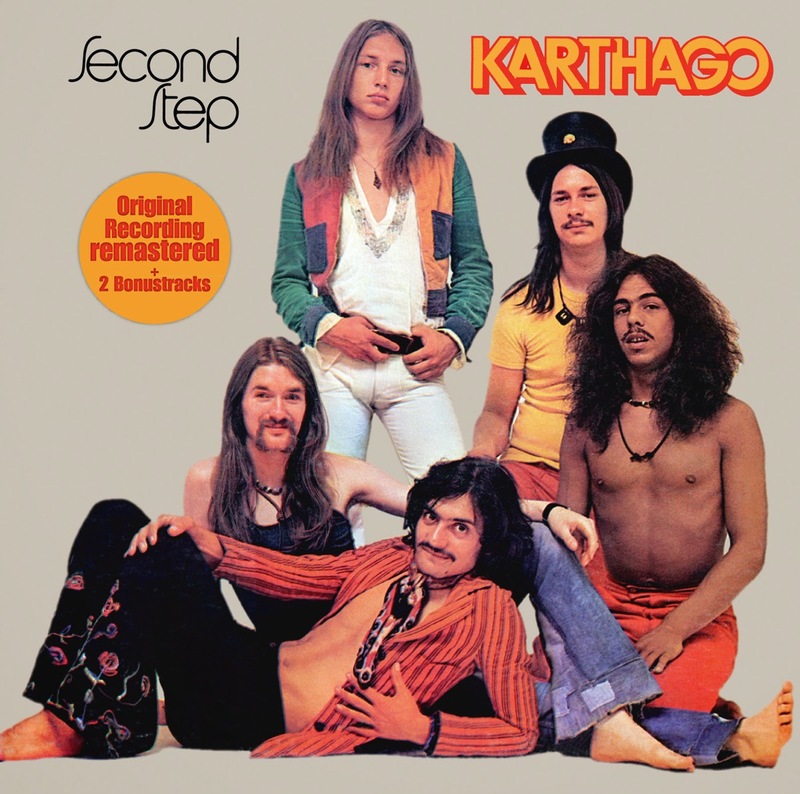 Karthago's sound was influenced more by North American rock than by anything that was coming out of Europe, composed of a tapered and rather simplistic mixture of light funk and freestyle jazz with a basic rock & roll substratum for everything else to rest on. Within the album's nine tracks are melodies that are accommodating and recognizable, quite different than what was otherwise coming out Germany's music scene in the early '70s. "String Rambler," "Black Fire," and "Morning Surprise" best represent Karthago's breezy, undemanding air, led by the bright organ playing of Ingo Bischoff and fastened by Wolfgang Brock's unmitigated drum work. "Why Don't You Stop Buggin' Me" and the shimmering "wow" of "But I Know"'s keyboard-guided intro lead into some electrifying pieces, with comparisons to Steppenwolf, Procol Harum, and even early Chicago arising from the melodies. Although labeled as a progressive band, Karthago's sound is more along the lines of German rock rather than prog, with shorter song lengths and a tendency to balance out the keyboards, guitar, and percussion equally throughout their music. After their fourth album in 1976, Karthago broke up, with Gerald Hartwig joining the more prominent Guru Guru and Bischof hooking up with Kraan. Second Step (1973) and 1974's Rock 'N' Roll Testament begin to show signs of commercial leanings, but their last installment, entitled Live at the Roxy, is just as impressive as their debut album." 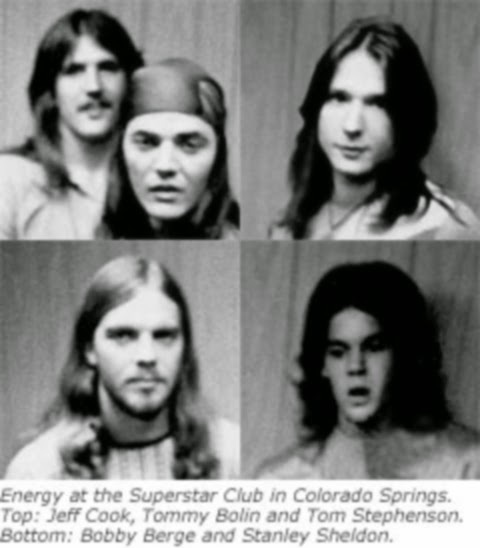 Energy were formed in 1971 in Boulder, Colorado when Tommy Bolin and Bobby Berge left Zephyr (see Vol 49). They appear with a Radio broadcast, having never released an official LP. The members in the most well-known lineup were: Tommy Bolin: guitar, Jeff Cook: vocals & harmonica, Tom Stephenson: keyboards & vocals, Stanley Sheldon: bass and Bobby Berge: drums. "Energy didn’t release any official albums or singles, but did complete a number of studio recordings, some of which appeared later on Tommy Bolin ArchivesCD releases. The first lineup of the band featuring Steig concentrated on long intense jams, often featuring Steig’s flute more than Tommy’s guitar. The band’s appeal was notably widened after adding a vocalist, beginning with Gary, then Jeff and later Max. The greatest amount of existing live material features Jeff Cook, and shows the band ranging from slow blues to rocking blues to hard rock to marathon fusion jams, often in one performance. Their studio output showed a band that would have made the big time if they had the power of a record deal. Some of the material written by Tommy with John Tesar and Jeff Cook went on to be used by Tommy in later bands. “Got No Time for Trouble” and “Praylude/Red Skies” were used in James Gang, “Lady Luck” with Deep Purple and “Dreamer” was used on Teaser." Lot's more information here at the official Bolin website. Hydra are a band that I am still saving for another southern rock comp. They supply a nice southern rock interpretation here with great enthusiasm and cool vocals! 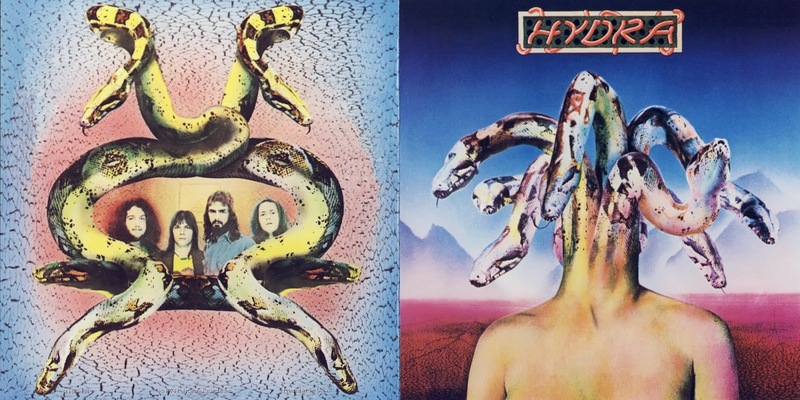 "Hydra debuted in 1974 via the release of the group's self-titled album. With the Dallas, Texas to New Orleans "Glitter Queen" setting the LP in motion, many would have expected that the song was recorded by a glam group. By contrast, Hydra rolled out of the deep South, where the un-glam NASCAR, grits and guns defined the slower-paced way of life. Nevertheless, "Glitter Queen" is a strong intro track that is competently chased by "Keep You Around" and "It's So Hard". 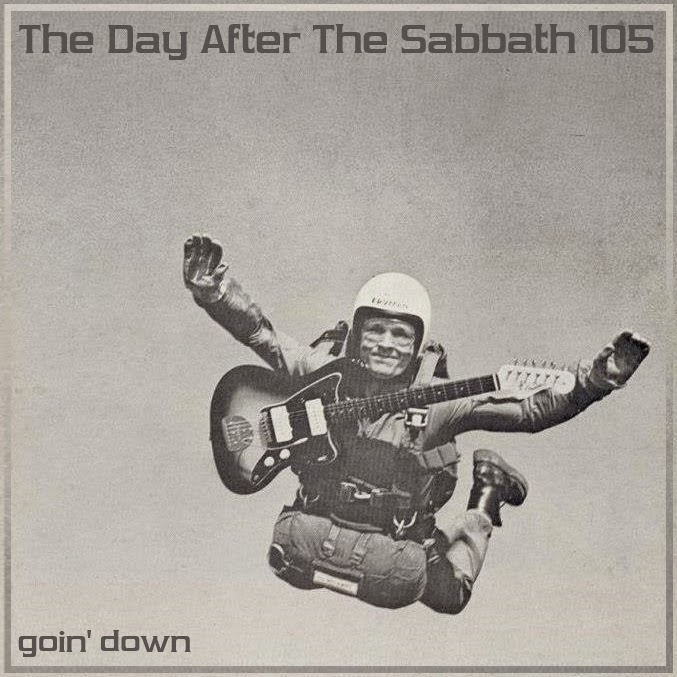 A cover of "Going Down" and the lengthy "Feel the Pain" fill-out the rock 'n' boogie side A. The upbeat "Good Time Man" continues the down home party groove, and the shortest track from the album, "If You Care to Survive" is delivered with aggression. The seven-minute-plus "Miriam" closes the Hydra LP with a mellow arrangement. As part of the Capricorn Records family, Hydra should have been a larger player from the proud '70s Southern rock scene." To finish off, we have Don Nix himself giving us the ultimate rendition of Goin' Down. A rip-roaring live stage performance. Toward the end of the song, Don admits he's been 'down' since he was two years old, and ad-libs the phrase "A chicken ain't nothin' but a bird, and a bird ain't nothin' but a fowl", which seems to come from an old Cab Calloway song called "Chicken Ain't Nothing But a Bird". Then he goes on to state how Furry Lewis (blues hero of Don Nix who was part of The Alabama State Troupers) hasn't been kept down for 78 years. Does this shed more light on the origins of Going Down? He also Allmusic :- "Don Nix had deep Southern soul and blues roots, getting his start playing with Steve Cropper and Donald Duck Dunn in the Mar-Keys. These roots aren't as evident on his 1972 project Alabama State Troupers as his association with Leon Russell, whose pioneering work can be heard all over Road Show, the double-LP that captures the wild revue Nix took across America in 1972. Cut firmly from the same cloth that Russell provided for Joe Cocker's Mad Dogs & Englishmen revue, along with the similar Delaney & Bonnie band, the Alabama State Troupers is a careening rock & roll outfit that touches upon soul, country, gospel, and, in its occasional frontman Furry Lewis, blues. Lewis stepped into an absence left by Lonnie Mack, a superficially more suitable match for Nix, co-vocalist Jeanie Greene, and the Mt. Zion Band & Choir, but Lewis gives this an unexpected sense of community and heritage, emphasizing how the Alabama State Troupers stretch back far. That said, Road Show is very much an album of its time. 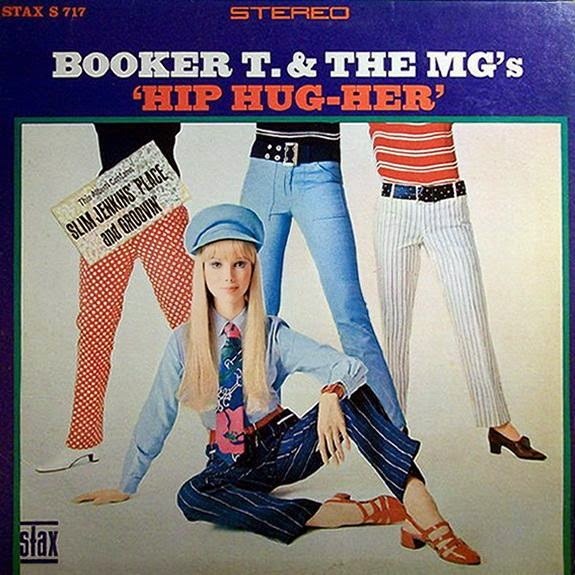 Specifically, it is part of the Leon Russell axis, sounding like a kissing cousin to Delaney & Bonnie due to Nix's traded vocals with Greene, but its attitude is slightly closer to Mad Dogs & Englishmen, often feeling so overstuffed that it is about to burst. Nix isn't a vocalist of Cocker's stature, nor is Greene close to Bonnie Bramlett, which makes the wildcard of Lewis all the more compelling; he gives them gravity but also a bit of mischief. 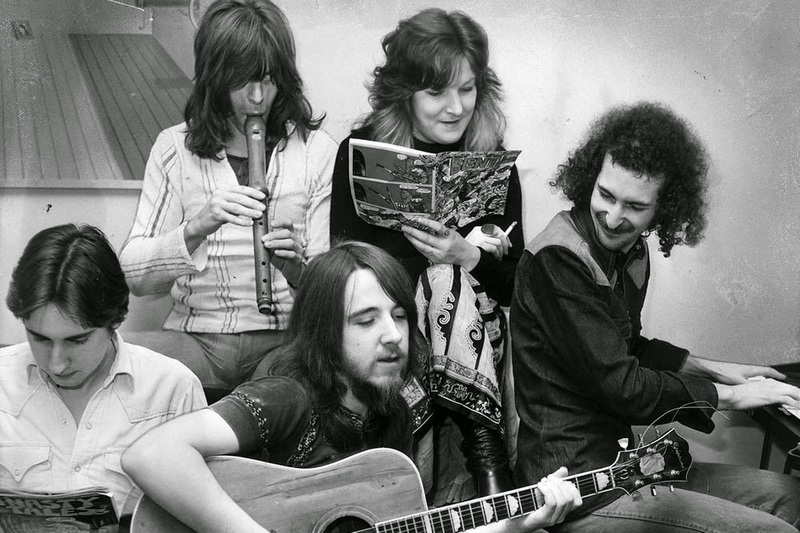 Nevertheless, the star in Alabama State Troupers isn't who is on the mike but rather the group itself, a collective that plays the kind of rambling, raucous American music that was briefly in vogue in the early '70s. Few have picked up this thread since, but that may be why it still sounds vital: it's teeming with passion, conviction and ideas that are still potent years after the music has receded into history." Thanks for listenin', and keep Goin' Down!